An ancient burial site in Cornwall is being auctioned in London on Monday. 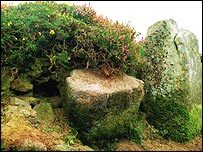 The Bronze Age barrow is on moorland near Nancledra at west Penwith, and has a price tag of at least £150,000. It was built 4,000 years ago, but its sales potential was discovered two years ago by its owner, musician Nick Potter, who bought the land from relatives. Experts believe the site is unlikely to hold any treasures of historical value as it has been raided over the years and the acidic soil has destroyed any bones. But Mr Potter believes the barrow is worth its hefty price tag, even though rules prevent anything being built on it. 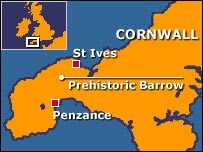 It is one of 2,500 barrows in Cornwall and is being scheduled by English Heritage in a process similar to listing of houses. It consists of two rings of stones, the largest of which is 11.5 metres in diameter. Some of the bigger stones are up to 2 metres wide and 1.22 metres high. The auction takes place at the Royal Garden Hotel in Kensington High Street.